Welcome my dear friends. Today is a day off, which means I have prepared a lot of interesting projects for you.MeFy is a platform in the field of medicine on the blockchain.Usually the health is considered to be the responsibility of the person. 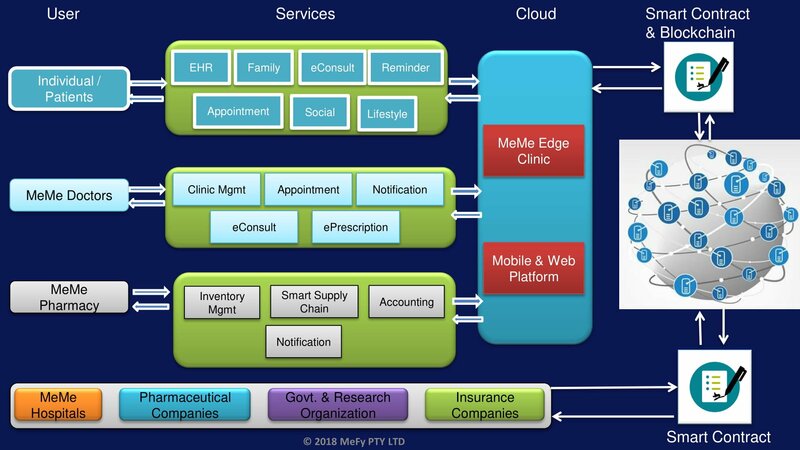 At MeFy, it is believed that increasingly, society will have a great impact on the changing health conditions of people around the world.MeFy, with its unique and disruptive healthcare platform, brings together the healthcare industry and patients. It starts with individuals but includes friends and family, it connects doctors with pharmacists, researchers and pharmaceutical companies. Now in this area there are a number of problems. Despite impressive growth, the health industry was inconsistent. Although we have world-class hospitals, state-of-the-art technology, highly qualified doctors and health professionals, the average patient faces high prices, insufficient access and inconsistent quality. Due to changes in lifestyle and other parameters, the increasing prevalence of chronic diseases and comorbidities, combined with their enormous economic impact and growing shortage of health workers, are the main cause of higher mortality. Thus, changing the approach to care is essential. Mefy operates on a subscription basis, where a MeMe Care user subscribes to an annual subscription, allowing them to run any number of tests throughout the year at the expense of supplies only. Due to its function eConsult it connects the world of doctors world patients, thereby solving the problems of accessibility and with the help of the device Edge MeMe, it ensures the authenticity of test performed. HEALTH. Keep your every interaction with the doctor recorded, all health statistics and reports in one place so it’s easily accessible when needed. eCONSULT. Consult your doctors at any time in any place. EVENTS. Captures your data to guide you to your health. REMINDING. Never miss a medication or an appointment again. DIET. Know what you consume. FLORENCE . Captures data about your health and lifestyle so that it can guide you in all aspects of your health. MEME OF EDGE. Subscribe to our services to check your life cycle statistics of your health as many times as you need. MEME AI. Automatic recipe based on condition and old data for medicine itself. The dates of the public sale will be known during the pre-sale. You can participate in the pre-sale right now, the public sale will be later. Roadmap. On the project website there is information about the road map, calculated until the end of 2019. Team. Also on the project website provides information about the developers and advisors of the project, there are links to linkedin, so if you want you can read each member. In conclusion, I would like to say that I am interested in the idea of this project, as medicine needs the introduction of blockchain technology.